International Childcare Trust's Winter 2005 Newsletter is available as an email attachment and from this website (see below). You will need Adobe Acrobat Reader (which is a free programme) to view the newsletter on your computer. You can also email us at: [email protected] to let us know whether you would like us to send you the newsletter as an email attachment or whether you would like to be emailed the weblink each time a newsletter is available on the ICT website. Your viewing the newsletter online or printing it out from your computer will save ICT money. 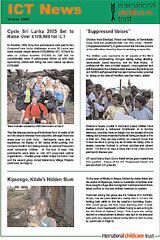 Download the newsletter below or from the image opposite.